I'm thinking about Easter and the preparations for the weekend. Heart and home. Yesterday, after school, my eldest granddaughter and I made some bags of Muddy Buddies as treats for our Easter celebration. We enjoyed chatting and playing together, and she stayed for dinner with us. Now 8, she is growing up so quickly and I cherish the time I have with her, and with each of my other grandchildren. The quiet of this morning is more to do with the soft and steady drizzle of rain and the gray skies than with what's going on in my head. There things are flying around with wild abandon as I make lists and flit from one item on my to-do list to another. Just now, as I sit in my chair and watch the rain fall and listen to the quiet of the house my mind calms. It would be a good day for curling up with a book, or some stitching, and a cup of tea. That will have to wait. The fawn lilies are now in bloom in the woods, mostly white, floating like stars just above the mossy ground. I spied a clump of pink fawn lilies in the rain. Erythronium revolutum. I believe I prefer the white ones. These lilies are native to the west coast of North America. There's always a little leap of internal joy when I see them emerge from their flat, spotted, close to the ground leaves. Last weekend's Lemon Tart. 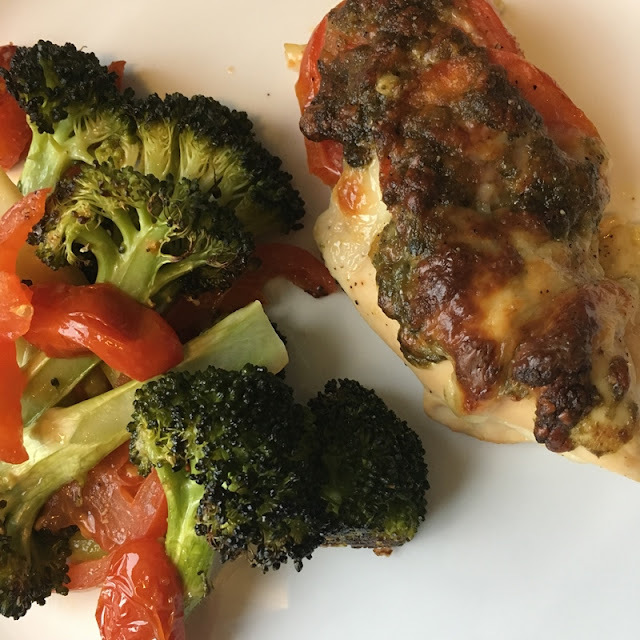 This is a close version of the recipe I used, from Laura Calder. It's not too sweet with a decided lemon flavour and just enough pucker to satisfy. I made a press-in shortbread crust, baked blind, that worked well. Last night, after I took Adria home, the evening light beckoned me to the garden. I cut lemon balm - it's a bit invasive, but I let it stay because it can fill in gaps nicely in the garden, and transplants well. Maybe too well. On my walk the other evening I picked the first sprig of lilac. Lilacs will be the next flower to rush into spring. It seems to me that spring is full of hurry. The flowers tumble over themselves, all in a commotion to bloom. Snowdrops barely fade before crocus and daffodil and muscari and hyacinth rush upon the scene, closely followed by tulips and anemones. Now the cornflowers are forming blooms, and tight rose buds will emerge. It's unstoppable. Hooray for relentless spring. I feel like I can't keep up. I'd like to enjoy each one longer, if I could, but no, we move on to the next beautiful thing. The bustle can be exhausting! A bunch of spray roses came home with me from grocery shopping yesterday. I thought they were pinker than they are, but the soft blush is still very pretty. I lit a candle this morning, thanks to the rain. We'll be celebrating our Easter dinner as a family on Saturday evening this year. That's what works best for in-laws. It's always good to be flexible even if it means tradition sometimes needs to be tweaked a little. Dinner will include a baked ham with TWO sauces - raisin sauce and sweet mustard sauce - because it's TRADITION. Scalloped potatoes, probably some broccoli, bright carrots, and a fresh green salad. Dessert is still not decided. I'm debating between chocolate mousse and an orange chiffon cake. When I put the question to Adria yesterday, she said, "why not both?" Smart girl, that one. Thanks for reading this rather rambling post. I wish you all a most joyous Easter as we remember the sacrifice of Christ, and the triumph of the Resurrection. The air is soft in late afternoon or early evening. Perfect for walking. Plenty of grey skies and rain mean that everything is green, green, green, a thousand shades of green, and the blossoms are popping out everywhere. Henderson Shooting Stars (Dodecatheon hendersonii) grown on thin stems that seem barely strong enough to hold up the flowers. When I looked up the Latin name today I learned that Shooting Stars are in the primula family. Do they grow in your corner of the globe? A magnificent trio of prunus trees grows in one garden along a nearby street. The ground beneath is covered in soft pale petals and more petals drift downwards in the slightest breeze. I was caught by their beauty and spent a fair bit of time admiring the trees as I approached. Today is Palm Sunday and I wonder, should the Triumphal Entry of Christ have occurred in our city, if we might have waved cherry blossom branches in place of palms to praise the Lord. We spent some time with friends this weekend, visiting Poet's Cove on Pender Island. I went for a walk with one friend, in steady rain. We returned quite drenched, just in time to see the clouds dissipate and the sky turn blue. 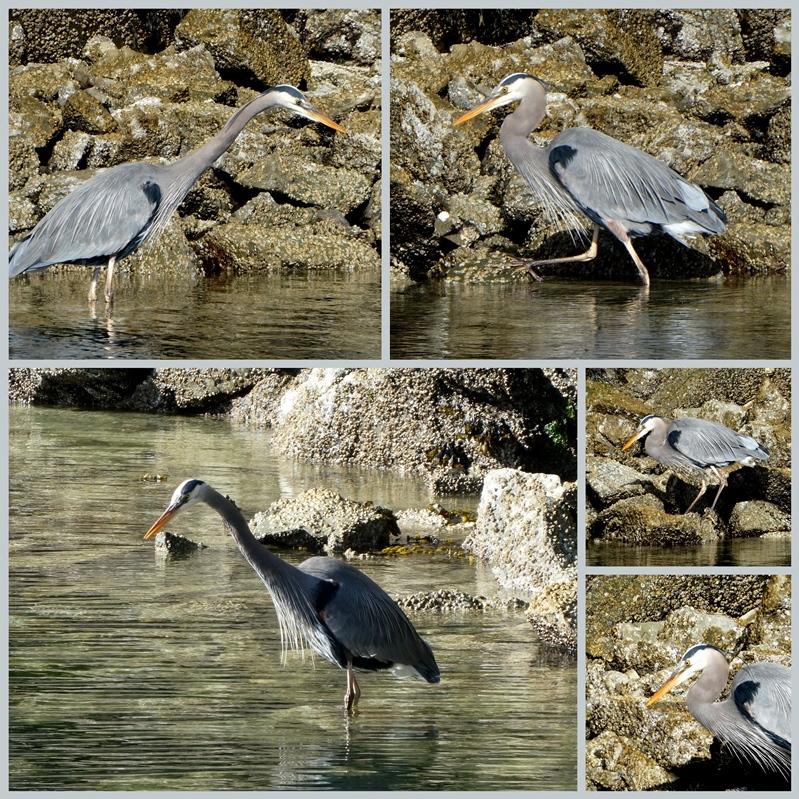 There is a Great Blue Heron that I've seen on several visits who likes to fish along the rocky shore facing the dock. He's a handsome fellow, don't you think, with the varying shades of blue and the soft breast feathers that seem to float in the air? We watched him stretch out his neck and stand, motionless and intent, and then, quick as a flash, duck his beak into the water and come up with a fish which he promptly swallowed. He then retracted his neck, turned, and picked his way along the rocks to shore. When we visit Poet's Cove we reserve a cottage with a kitchen so that we can prepare our own food. And we eat well. One couple prepared a dinner with barbecued beer can chicken, and a carrot orzo side dish. Another couple provided a salad and I brought along some sourdough bread that we baked there. Dessert was a lemon tart, a small dish of cold blackberry soup, and white chocolate hazelnut pralines. We are thankful for good friends with whom we laugh and sometimes cry, share delicious food, and wonderful conversation ranging from gardening to politics to religion to travel. We might not agree on everything, and that's just fine. Tulips are beginning to bloom here and there, and these pretty ones are on the deck at Poet's Cove. Linking with Mosaic Monday hosted by Angie of Letting Go of the Bay Leaf. Puffy cumulus clouds on the horizon and above the band of blue spoke of welcome rain coming. This photo was taken yesterday while walking around the Bog; as I look outside my window now, rain is dripping down. I can almost hear the dry ground slurping it up. The earthworms will be happy, too. A sharp wind blew, but once we were in the shelter of the trees in the Bog, it eased and the warmth of the sun penetrated instead of the chill. A flash of red caught my eye and we saw a very busy Downy Woodpecker drilling into a rather thin branch. A bit farther along bright robins clustered in a tree just beginning to leaf out. In the distance, winter skeletons of trees show clouds of green haze around them in that delicate, yet bright shade of early leaves. Lemons are plentiful in the grocery store just now, so a few came home with me to make Lemon Curd. I store it in the freezer in small jars. It's good on scones, toast, in tarts layered with fresh berries (soon they'll show up, too), or eaten by the spoonful. It's easy to make and here's the recipe I use. I adapted the method to ensure that it turns out reliably. Melt the butter in a double-boiler set over barely simmering water. Remove the pan from the heat and whisk in the sugar, lemon juice, and lemon zest. This is when you would add the salt, as well. Add the egg yolks and whisk until smooth. Place the double-boiler over the heat again, and cook, whisking constantly, until the mixture thickens. Make sure to scrape the corners of the pot well as you whisk. I occasionally run a silicone spatula around the edges to ensure that all of the mixture gets whisked. The mixture is done when it coats a wooden spoon and you can draw a line through it with another spoon. Pour the lemon curd through a fine mesh strainer into a bowl. Let cool to room temperature, whisking occasionally. Refrigerate, covered, until ready serve. OR pour into small jars (I used the half cup ones) and freeze. Lemon Curd will keep for a month in the refrigerator and much longer (several months) in the freezer. On Saturday morning Tim saw a flash of feathers swoop across the back garden before disappearing through the hedge. All the birds at the feeders scattered. The feathers flashed again and alighted on a fence so that we could identify it as a Sharp-Shinned Hawk. We don't often see them quite so low to the ground and wondered if there were some little critters in our garden that piqued his interest. He hung around for awhile before flying off again. It took awhile before the little birds felt brave enough to risk the feeder again. I picked a little bouquet from my garden - hyacinths, muscari, a couple of frilly daffodils, and candy tuft. The green filler is lemon balm, now showing up everywhere! Today in Foods class the students made chocolate cupcakes. It's such an easy recipe and it always turns out. Today, one group of students added 1/4 CUP of salt in place of 1/4 teaspoon. Oh my. I took a little taste and quickly disposed of it. Wretched! The girls (it was a group of girls) took it well, laughing about their mistake, and other students shared their cupcakes with them, so they at least got to have a treat. Such a mistake reinforces to me how inept many young people are in the kitchen. I would have expected them to question that amount of salt in any dish, but especially baking. I am frequently surprised at how many students do not know the basics of cooking anything. By Grade 8 I was cooking entire meals, and there are still a few who do that, but it's not the majority any more. Life skills like these are so important, I think. On the other side, to be fair, another student came up to show me a photo (on her phone) of a chocolate mousse cake she had made for her grandfather's birthday. She had decorated it with fresh fruit and it did look lovely. A cake to be proud of. I'd better get this posted before the second week of April is gone! I hope Spring (or Autumn) is showing up for you wherever you live. I've seen photos of April snowfalls that would be a bit discouraging. Happy April days to you! "Today has been a day dropped out of June into April." The sun streams in through the living room window, lulling me into idleness in spite of the streaks and dust I see there. Cherry tree petals float through the air and drift into soft pink heaps along the curbs. In my garden the hyacinths are at their peak, sweetly fragrant. Bees busy themselves in the muscari, curling their bodies around the blue um-shaped flowers in order to extract every bit of nectar. This weather is too lovely to last. This evening clouds will roll in bringing much needed rain. Out in the garden the soil is dry and pulling weeds difficult. Our daughter and her husband visited Japan in February and brought back this cute owl bell for our garden. Tim hung it on Saturday, on a corner of the garden shed where we'll be able to see and hear it. The garden beds are mostly bare. I set out strawberry plants, chosen from among all the runners that clog the mulch paths between the garden beds. It's hard to keep the strawberries contained. My cousin is a part owner of a local fair trade coffee business and he recently advertised burlap sacks, for free, to use as mulch on vegetable beds. He's used them with success, so I went by and picked up a trunk full. I hope they help keep the weeds down for they have been ferocious here the last couple of years. I plan to put in carrots, radishes, and lettuce this week. Our grandson turned 5 in February and we promised him a ride at the go-cart track when it opened. On Saturday he and Grandpa set out together. His father drove another go-cart by himself. Such a big helmet on such a little neck. It's too bad that the protective hair net fell over Felix's eyes. Another successful sheet pan dinner. Sausages in chunks, with carrots and asparagus. I added the asparagus for the last 15 minutes of roasting. The seasonal change is inspiring, don't you find? The flavours of lemon, fresh green things, and tart rhubarb are what I'm anticipating these days. Spring break is over and I'm back to teaching. I have a few sewing projects on the go - a shirt for myself, a table runner to complete, and a collection of produce bags that I want to make. The evenings are so full of light and loveliness just now and when I walk after dinner the sky slowly streaks to watercolour washes of yellow and pink. I come home and light a candle, not for light, but for coziness. How is April springing (or falling if you live in the southern hemisphere) in your corner? This has been a lovely spring break. One week away and one week at home. I confess to having made a fairly long list of things to do during this second week, but few of them have been accomplished. There's been a little gardening, some sewing, a lot of reading, and definitely more daydreaming than usual. Tim was gone for a couple of days and when he's not around I tend to stay up too late reading and then drag around the next day. It was a glorious day, full of sunshine with wispy clouds in the distance, the chirp of birds, and lots of blossoms to admire. I wandered along the pathways, stopping to watch squirrels play peekaboo with me, and smiling at a few other walkers. Off to one side of the property the fence is broken by one wall of a wooden building adjoining the grounds. Although I wanted to take a good look into the windows, I thought better of it, but from a distance it looks to be a gardening shed. The gnarled tree just beginning to bloom, an apple variety, perhaps, certainly looks well there. Here in my own garden the pear tree is in bloom. I've seen few pollinators around, though, so I hope they are there when I'm not looking. Daffodils nod happily in the sunshine. Muscari stand sturdy. Hyacinths, blue, pink, and white waft their sweetness in the air. Tulips are mere leaves as yet. Green leaves sprout all over the hydrangeas and lilacs. It's a riot of life out there. Today there's laundry to do and a little cleaning. A regular physio appointment at noon, and sadly, a memorial service for a church friend, then a birthday celebration for Tim with family. 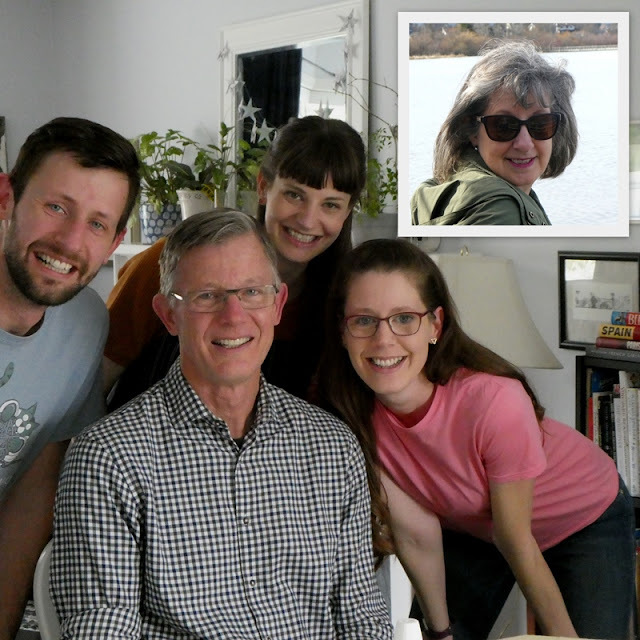 I took the picture of Tim and our three children and put it up on Facebook. A few people wondered about the photographer behind the photo, so I added my own face in there, too, as a bit of a joke. A couple of weeks ago our Vancouver family was over and we had dinner together. It was just before spring break began and Tim and I were leaving the next day, so I told everyone we would just order pizza and I'd make a salad. Well, I got to thinking about other options and ended up making Greek meatballs, rice, a big salad, and lots of roasted vegetables, along with a raspberry cheesecake for dessert. The change of menu plan did not come as a surprise to my children, who know me all too well. One couple said they had placed bets on whether or not the pizza would actually happen; another said they wondered how long I had held out, and so on. They teased me unmercifully. What can I say? I like to cook. Besides, there were things in the fridge that needed to be used up before we went away. So for tonight, there will DEFINITELY be pizza! Some of the names and geography of the west coast of Canada can be confusing. For example, we live on Vancouver Island, but the City of Vancouver is on the mainland. The mainland coast is a tangled line that curls around deeply cut fjords and rocky islands of all sizes. The area known as the Sunshine Coast, on the mainland, is accessible only by ferry. Last weekend, Tim and I drove north on our island (Vancouver Island) to catch a ferry back to the Sunshine Coast. We spent a few days in Powell River, then took another ferry to Earl's Cove for some more vacation time, then a ferry to Vancouver. We drove through the city to catch yet another ferry, our usual one, back to Victoria. We made a circle. Ferry, car, ferry, car, ferry, car, and so on. What can I say - it was a spectacular trip! Cloudless blue skies, calm seas, comfortable lodgings, good food, and lots of walking. Lakes versus ocean. It's a hard choice. I grew up with lakes - our family went camping and fishing, but I've come to love the ocean, as well. I don't have to make a choice, do I? The catkins are forming on the trees, but we didn't see many new leaves until we returned home. On one of our ferry rides, from Saltery Bay to Earl's Cove, I just couldn't stay inside. I went out on deck and found a sweet spot where I was mostly sheltered from the wind caused by the ferry movement and I drank in the beauty all around me. Mountains pierced the blue sky while small rocky islands drowsed in the morning sun. White gulls caught the light as they flew against the backdrop of fir and pine forests. It was achingly beautiful. One day we hiked to Skookumchuck Narrows, famous for its rapids and whirlpools caused by the twice-daily tide change where the difference in height between one side of the rapids and the other can sometimes equal 9 feet. The Narrows draws thrill-seekers from around the globe to kayak and dive here. The only divers were saw were a large raft of Barrow's Goldeneye sea ducks riding the currents, bobbing, ducking, splashing, having great fun. 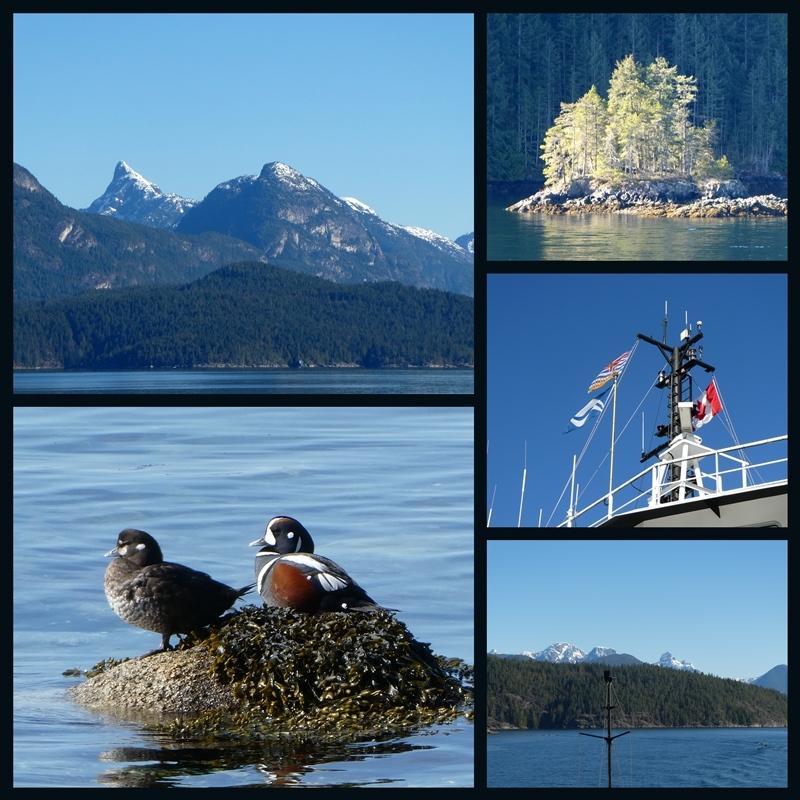 We visited Gibsons Landing, where the 1970-80s CBC production The Beachcombers was filmed. That series brought many people to the area, and the town pays homage to the show with displays of the boat, photos of the actors, and a restaurant named Molly's Reach, modeled after the one in the show. Another day we walked into Smuggler Cove, a place we visited by boat in the summer of 2016. This was our last full day and pale wisps of cloud streaked the sky, signaling the end of the clear blue. Now we're home. This morning I went out for groceries and I'm catching up on laundry. Several trees on our street burst into bloom while we were away and I look out my window to see clouds of pink and white blossoms. So pretty. I'm itching to get out into the garden and that's where I'm headed this afternoon. Note: I'm working on my blog layout and am having a terrible time with the sidebar gadgets overlapping the text. I've removed them for now - anyone know how to fix this? I've tried the CSS code available online, but that doesn't seem to be working.